The Wizard of Oz is one of the most popular stories and films of all time. Frank Baum wrote his book in 1900, Judy Garland immortalized Dorothy in MGM's 1939 classic, countless other performers, writers, even motivational speakers and wealth managers have visited Oz through the years. This year, Oz is more in the public eye than ever with two films being released - Oz The Powerful and Dorothy of Oz (the latter based on a book by Baum's great grandson, Roger Baum). It is a great time to celebrate Oz with a Festival. The Wizard of Oz Festival is a unique event that will bring Campbelltown alive with a vibrant and diverse programme designed to include different sections of the community. An eclectic mix of artists, communities and Campbelltown venues will go off to see the wizard with this festival that celebrates all things Oz – brains, heart, courage, hope and a sense of home. Community festivals are a great way to celebrate the community and promote arts and creative expression. 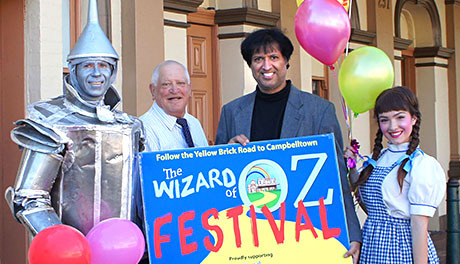 Apart from directly involving the local community, The Wizard of Oz Festival has the potential to bring people into Campbelltown for specific events from other parts of Sydney. They will be encouraged to stay on, go around, eat, shop and hopefully at the end of the day, say with Dorothy, "There's no place like Campbelltown!" The Festival's nominated charity is the 24 Hour Fight Against Cancer Macarthur. We hope that you will enjoy The Wizard of Oz Festival that has been so generously supported by local businesses and tireless volunteers. But more so, we hope that your walk down our Yellow Brick Road will inspire you to expand your thinking, open your heart and build the courage to truly connect with your own Hero's Journey.